In this post I will describe how to implement an algorithm to project a point onto a line. There are numerous formulas to achieve this — most of which terser than the method described here — but their scope is also narrower: they assume your point is already projectable onto the line. Here I will widen the scope and describe not only how to project the point in a didactic way, but also how to test if the point is projectable. First and foremost, you have to test whether the point is projectable onto the line in the first place. 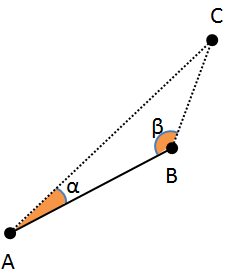 Let A-B be your line segment (a pair of Coordinate objects) and C the point you want to project. ABC coordinates form a triangle. 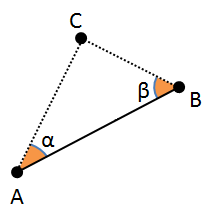 Let α be the angle of the A vertex and β the angle of the B vertex. C can only be orthogonally projected onto AB if both α and β are ≤ 90°. If α or β are > 90°, then the point cannot be orthogonally projected onto AB. Once you know the point is orthogonally projectable, you can find the point where C projects onto the AB segment. 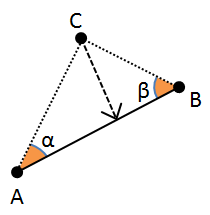 Trace an orthogonal line from C to AB. This will create a new point which is the point that C projects onto AB. Let’s call it p.
The implementation below will give you the Coordinate representing the point that C projects onto AB if C is orthogonally projectable onto AB. If C is not orthogonally projectable onto AB, the method will throw an exception. The code for testing projectability has been merged in this method since many variables of that method are used here as well. This entry was posted by Dalton Filho on Sunday, August 17th, 2014 at 6:24 pm	and is filed under GIS, Java. You can follow any responses to this entry through the RSS 2.0 feed. You can leave a response, or trackback from your own site.